When Ed told our neighbor that we were vacationing in Southern Illinois, our friend laughed because he thought we were joking. We weren’t. Lily was 10 months old at the time, and we didn’t want to travel far. She hated traveling; she hated her car seat. When she did sleep in the car, it wasn’t for very long. So we decided to pick a destination that would require minimal travel. Sometimes, a place between your home and your travel destination is like stumbling upon a treasure in a scavenger hunt. Effingham is not your typical tourist destination, but this city has some interesting things to see. 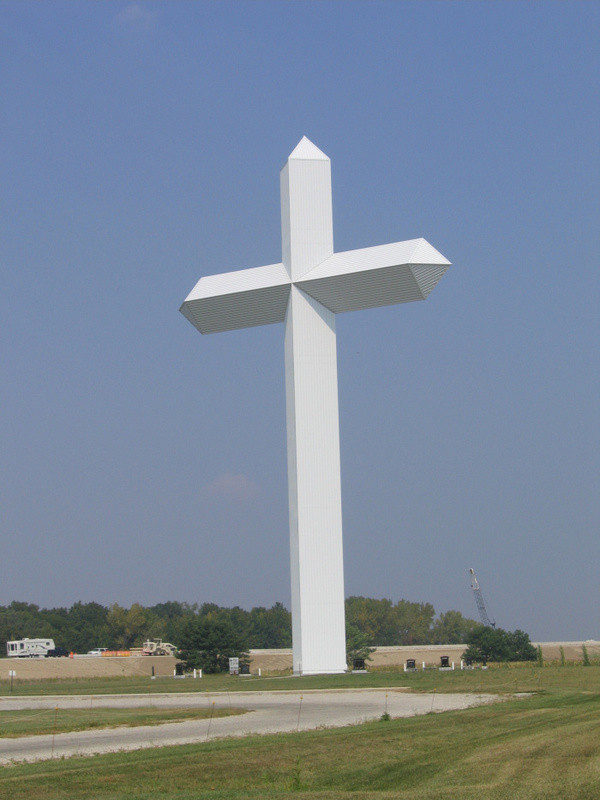 It is in Central Illinois, right where Interstate 57 and Interstate 70 meet; before you even arrive in Effingham you will see the 198-foot tall Cross of the Crossroads. Since our driving time was cut in half, we were able to spend a little time in Effingham. We strapped Lily in her stroller and took a self-guided walking tour of Effingham’s Sculpture on the Avenues. If art is your thing (as it is mine!) there are over 20 permanent sculptures to see in this outdoor exhibit. After our walk, we were fortunate to stumble upon an outdoor pork chop dinner, sponsored by the Lion’s Club, to benefit victims of Hurricane Katrina. The food was fantastic, the money spent on tickets went to a good cause, and there was even dancing! 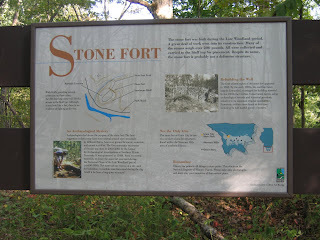 During our week’s stay, we explored the Shawnee National Forest and Illinois State Parks. 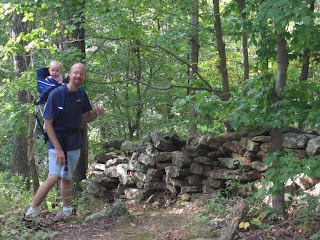 Our first hiking trip was to Giant City State Park. As we hiked among the bluffs, we literally felt like we were walking in streets carved out by giants. We also were able to hike on the top of a bluff, where an old stone fort, probably built by Native Americans in the late Woodland period (AD600-900), was discovered in the late 1800s. How do I remember the details about this pile of rocks? No, I don’t have a photographic memory; instead, I often take a picture of the sign marking the trail. With a digital camera, I don’t worry about wasting my film on pictures of signs like I would have 10 years ago! 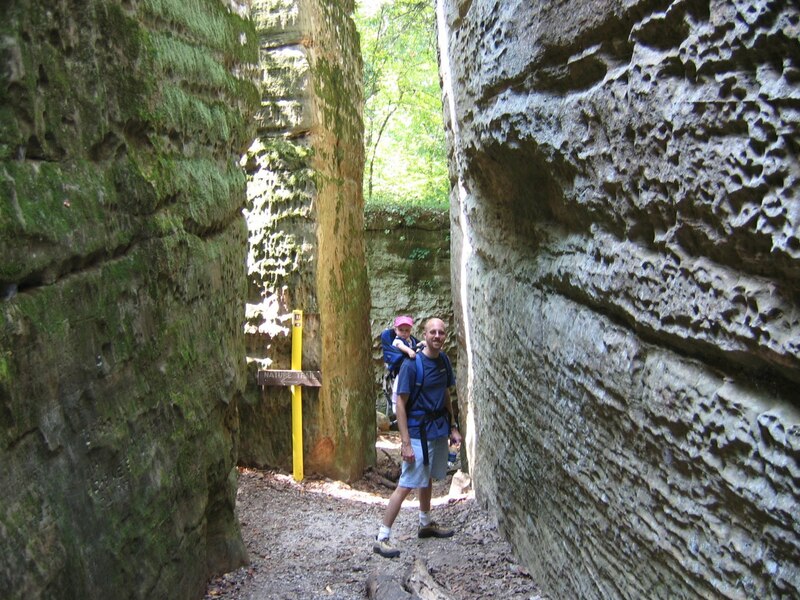 Our explorations in Southern Illinois were far from over. Next week: Garden of the Gods, Cave in Rock, and a historic hotel. Travel Tip Thursday is brought to you by Pseudonymous High School Teacher. Click on her button to visit her blog! There is nothing wrong with vacationing close to home, I totally get that. We won't even go on vacation with our kids until they're a little older. We can barely control the chaos at home, there's no way we're adding a hotel and sleeping away to the mix.I love your pics, especially cute little Lily in the backpack! Sounds like a sweet adventure. 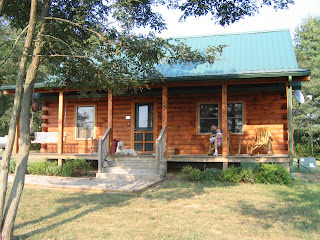 I love the cabin. And traveling with a ten month can always be a little unpredictable. We drove from FL to TN with a 12 month old (plus the other three) and it's not something I would be quick to repeat…And I love having a digital camera, no saving film, you can just shoot everything. What a cute cabin. Looks like it was a great trip. This is such a funny post to me. I grew up in So IL. It feels like such a world away now. Many many many many hours I spent hiking in the Shawnee. 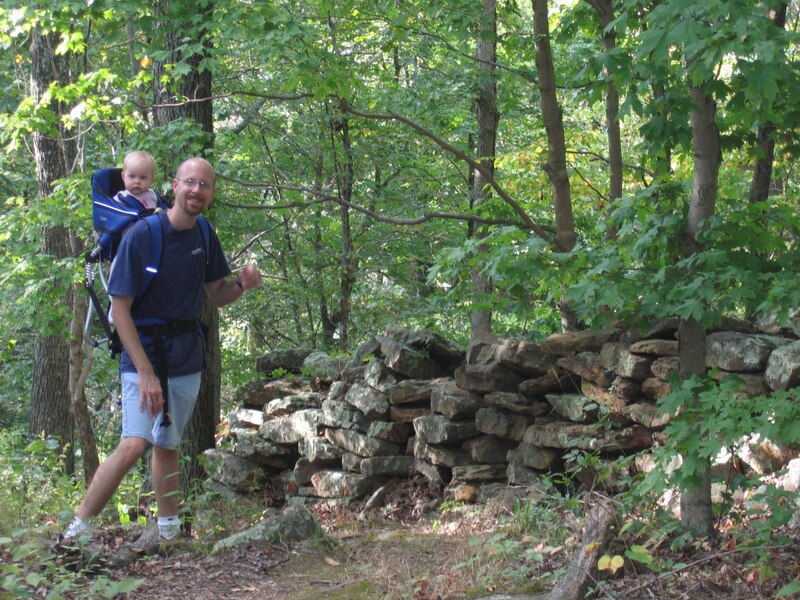 In fact, that is where I grew to love hiking. Garden of the Gods is still there! Praise God! When I was in high school, we chained ourselves to trees at the threat that some company was going to destroy it to build an outlet mall or some crap like that. And yes, cabins are great with kids. They love camping, but they are such lightweights! 🙂 Although, we've never been to one with a hot tub! Wow, how funny! I happen to live in Effingham, IL. I didn't really think many people had heard of it. I grew up in Chicago but we moved here about 6 years ago. If you ever come this way again, let me know! This is what I tell my husband ALL THE TIME!!! We can discover off-the-beaten track places to go taht aren't too far from our home. But he doesn't want to do that. And the idea of staying in a cabin would be abhorrent to him. I think this sounds fantastic! And I hear you about "travel fear." We are going to attempt our first ever long driving trip this summer … 12 hours broken up over two days. We'll see how that goes!! I need all the travel tips I can get! Traveling has taken on a new meaning over the past two years (after we were blessed with our little girl). I will be popping by again next Thursday!